Product prices and availability are accurate as of 2019-04-21 19:53:07 UTC and are subject to change. Any price and availability information displayed on http://www.amazon.com/ at the time of purchase will apply to the purchase of this product. These luxurious glasses were made in Italy; the mecca of glassware, where incredibly talented glassmakers have made it their life's work to produce exceptional drinkware that not only looks beautiful, but stands the test of time. These lightweight glasses are made of fine grade sands and finished in premium glazes that result in a drinking glass that's sturdier than the competition and strong enough to be used time and time again. Its heavy base helps prevent the glass from shattering when muddling. This exquisite 6 piece 13 ounce glassware set features luxurious and luminous Italian crafted glass that's sure to turn heads. 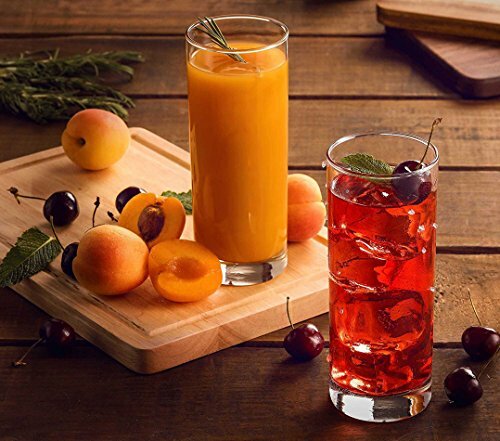 These fine European glass tumblers preserve beverage's crisp, rich texture for a fresh taste every time. Modern yet timeless, these highball glasses dawn a contemporary look that is perfect for entertaining and everyday use. With its sleek silhouette and clean design, this tumbler glass set is versatile enough for casual and formal use. 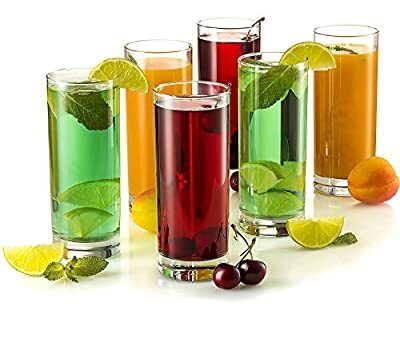 The drink glasses thin, cylindrical shape is easy to grasp, while their lightweight construction with thick base keeps glass from shattering while still being comfortable to hold for extended periods of time. Feel safe serving beverages to loved ones in this guaranteed lead-free drinkware set. 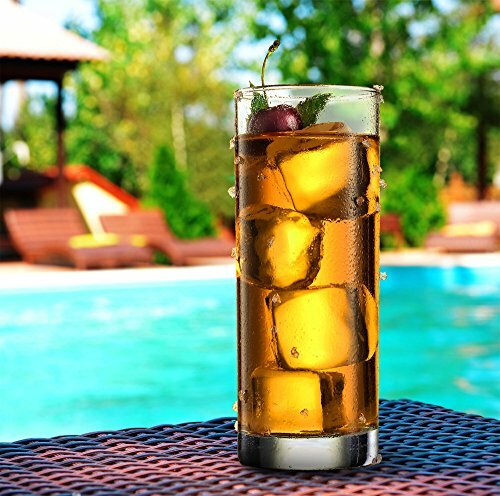 No worries about harmful chemicals and substances leaching into your drinks here! Look no further for the perfect Christmas, birthday, anniversary, or any special occasion gift. This highball glasses set of 6 is extremely easy to clean! Just wash each cooler glass by hand with soap and warm water or safely place them in the dishwasher! The glasses are 6 1/2" tall and 2-1/2" Diameter.